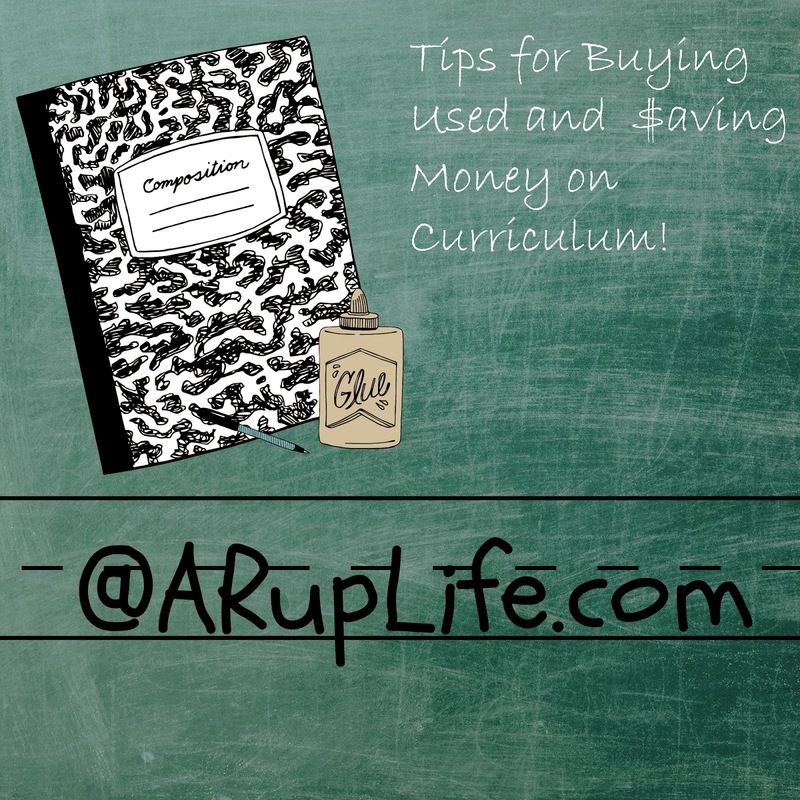 A RUP LIFE: Tips for Buying Used and $aving Money on Curriculum! Tips for Buying Used and $aving Money on Curriculum! I love a good deal. It is rare that I buy something for full price. When I became a homeschooler I knew that curriculum was going to be our biggest expense and I was determined to find a way to save!! I think the best places to buy used are yardsales, craigslist, ebay and facebook resale groups. I hope these tips will help you!! First thing you should do is some research for the actual market price of the books you need. Make a price list and keep it handy. Then refer to it so you know you are getting a deal. I recently saw someone selling a Mystery of History Vol 3 book in a resale group. She was asking $45 shipped. It goes for $45 new on Christianbook.com. Why would anyone pay that price for used? I wouldn't. Personally I would wait for Christianbook.com to have a sale or a free shipping code and order new then. Yet people do pay it. The thing is if no-one bought high the prices would come down too. It is a win/win for everyone! Know the current prices and don't pay too much. For some reason the resale price of Apologia/Mystery of History is very high so watch for lower prices. Don't be afraid to negotiate either! If the price is too high offer lower. The worst that can happen is that the seller says no. For craigslist search for keywords like: homeschool, homeschooling, homeschooler and curriculum. Also you can search for the specific product like abeka or Shurley. See if there is a large lot and keep what you need. Then sell off the additional items. I've done this many times and it has paid for my books plus given me a small profit! For ebay it is helpful to watch items and see what the going price is. Also try misspelling words so that you find a rare misspelled listing. Search cheap homeschooling lots and see if they have included something you are looking for. It is a great place for readers, chapter book and unit study books. You just have to keep looking until you find the right books for you. Facebook has probably become my favorite way to shop used books. The groups are constantly updated and you have to act fast. It is nice because you can also do an ISO (in search of) and have the seller find you! I hope these tips help you on being frugal with your used curriculum purchases. Remember the most frugal thing you can do is skip it if you don't need it! Be sure to click on the picture below for my frugal tips! Thanks for the tips. It is a blessing to find just what we need but at a fraction of the cost.